Be the first to share your favorite memory, photo or story of Ray . This memorial page is dedicated for family, friends and future generations to celebrate the life of their loved one. 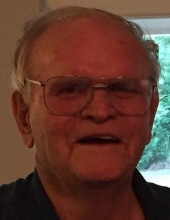 Ray “Doodie” Gene Dodds, age 89, of Breckenridge, passed away Saturday, February 9, 2019. The family will hold a visitation at the Melton-Kitchens Chapel, Monday, February 11, 2019 6:30 - 8 p.m., funeral service will be Tuesday, February 12, 2019 at 2 p.m., at Gunsight Baptist Church, Rex Boggs, officiating. Interment will follow at the Breckenridge cemetery under the direction of Melton-Kitchens Funeral Home. Ray Gene Dodds was born on October 14, 1929 to parents, Claud and Jannie Doods in Breckenrdige, Texas. He graduated from Breckenridge High School and played football for the Buckaroos. He also attended and played football at North Texas, Texas Tech and San Angelo State University. Ray worked for BJ Services for 35 years as a salesman. Ray enjoyed playing golf, gardening and playing dominos with family and friends. He was a member of the Gunsight Baptist Church. Ray was preceded in death by his parents and wife, Wynell Dodds. He is survived by two children; son, Rex Dodd of Breckenridge and daughter, Renee Warren of San Angelo, Grandchildren; Harley Dodds of Breckenridge, Roddy Warren of Dallas, Angela Yoes of Breckenridge and Rachel Bunn of The Woodlands and numerous great grandchildren. "Email Address" would like to share the life celebration of Ray Gene Dodds. Click on the "link" to go to share a favorite memory or leave a condolence message for the family.